HTC Boost+ APK has been updated to the latest version 1.62.866579. Besides the launch of its new smartphone, HTC 10, this company also released an app to support performance. Not only for their devices, but this app is also compatible with the other devices which have Android Lollipop as minimum specification. However, if we install this software on the other devices, there are features which cannot be implemented. Talking about the features in this app, Boost+ has similar features with this kind of apps. 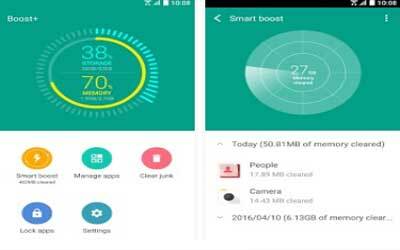 Memory cleaner, the application is able to clean up your RAM so smartphone performance will be optimal. There are some factors which affect performance of smartphones, including the use of RAM, cache, unnecessary applications, temp files, etc. This application is capable to detect, clean and optimize your Android phone. In addition to this main features, this app has security features. You can apply password to the application that you use so you can maintain your privacy. Another interesting feature is this app can detect apps that you never use. Boost+ will give notification to uninstall the app.It will improve performance and increase free space of your memory. Special features for HTC device is game battery boost. It will help you to save battery but you cannot use this feature if you are using another device. Well, this app has great user-friendly UI but it is similar with this kind of apps. It is free Android performance expert that smartly tunes performance, improves power consumption, clears unused junk files to reclaim storage on any Android device. This tool is great. It speeds up my phone and help me to manage my plenty apps. Sometimes I really have no ideas what these items are doing in background. Overall, this app works great and run smoothly on my device.